As you might know, I’m a runner. It’s a great sport because you can do it just about anywhere and it requires very little equipment. Yet, the right equipment can make all the difference in the world. Especially when it comes to shoes. 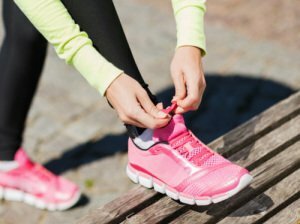 Unfortunately though, running shoe manufacturers fall into a trap a lot of us fall into, especially when getting organized. I call this trap change for the sake of change. Here’s what I mean. Every year or so, running shoe manufacturers get the itch to change things up. They take a perfectly good running shoe, one that runners like me have been using trouble-free for years, and they change it. Why? From my vantage point it feels like they’re changing it for the sake of it—not to solve any particular problem I’ve been having. The trouble is, in the case of running shoes and misguided organizing projects, these changes can create new problems that weren’t there before. If you’ve ever gotten the itch to organize something only to find yourself in the middle or end of it feeling like you hadn’t made things any better…then you know what I’m talking about. So how do you avoid falling into this trap when it comes to organizing? Follow these steps before starting your next project. 1) Identify what isn’t working. If you have the itch to organize a particular area in your home, start by brainstorming the real problem. What isn’t working? What specific problem do you want to fix? For example, if you want to organize your kitchen, make a list of the areas that bother you. Does the counter look cluttered? Is it cumbersome to unload the dishwasher? Does food go bad in the back of the pantry or refrigerator? Make a simple list and then move onto step 2. 2) Identify what is working. With your list of what’s working and what isn’t working in mind, brainstorm solutions. Browse the simplify 101 website, Pinterest, or home magazines in search of solutions to your specific organizing dilemmas. Make sure you give your brainstorming and researching phase a clear cut deadline. It is fun to brainstorm, research and dream…but once you have a handful of ideas that will solve your specific problem without unraveling what’s working, pick one and put it into action. So that, my friends is how you avoid change for the sake of it when it comes to organizing. If you know how to solve the running shoe dilemma…let me know. I’m all ears. I know exactly what you mean about those running shoes, Aby! My Asics seem to be running smaller these days. I have been sizing up. And it is not my feet as other brands fit just as they always have. Good luck with your shoe hunt! Thanks Cynthia! It’s so nice to hear from you. Thanks for your well-wishes on my shoe hunt. It’s so frustrating! Did you just go up a size on your Asics or switch to a new brand?